In seven days time well be taking part in the first BRSCC Porsche Championship meeting of the year, being held at the Snetterton circuit in Norfolk. 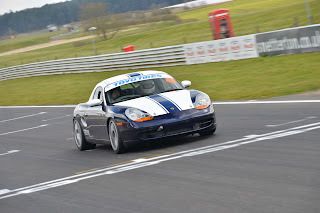 We haven't raced there for three years, so booked a standard MSV track day to shakedown the car, get my eye in on the circuit and let some family have a go at the same time. The MSV instructors read the riot act in the briefing, as recent events had been treated like test days (overtaking anywhere) and not track days, where novices and experienced drivers need to co-exist. It worked as track etiquette was good and the mix of classics, road cars, sports and race cars got on fine. The weather was bright, dry and about 10 degrees. Hopefully it will be the same come race day. In the morning we did a few runs focused on checking the reliability of the car. The only issue we found was a loose engine cover, so all went well. Handling was good with our guess at the setup. No particular oversteer or understeer issues - but the front end was bouncing up and down a bit too much on corner exits. The trick with open pit lane format days is to be on track when everyone else isn't. A couple of times we noticed the track was full, with cars queueing in the pit lane. This meant that in about 15 mins it would be empty as they all come in to cool down - time for us to head out then! In the afternoon we experimented with setup, corner techniques and gear choices. The track was far less busy too. 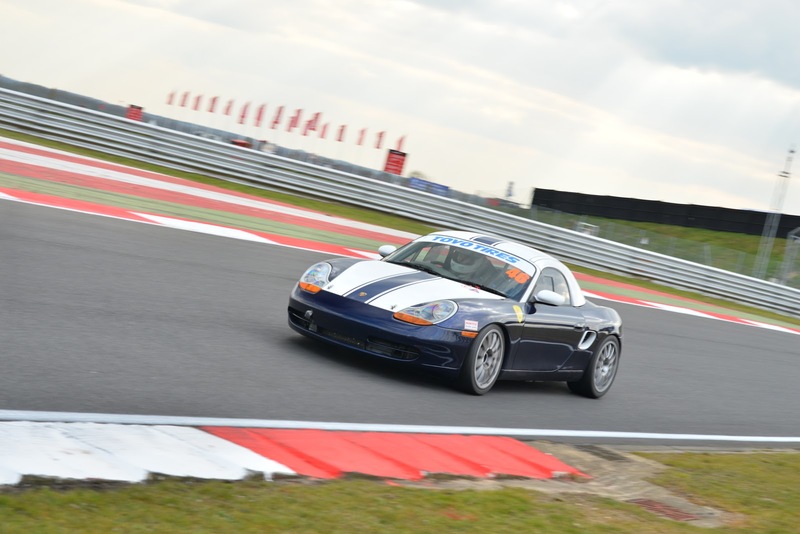 Snetterton is flat and fast, so the setup is likely to be fairly stiff on roll bar and damper setup. We went a bit too hard initially, finding the front end skidding under braking, especially into the hairpin corners. In the end we think we found a good compromise. 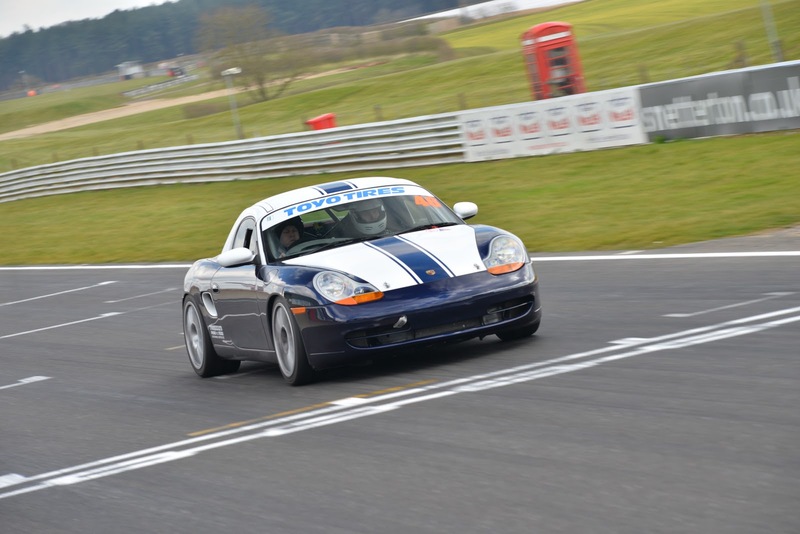 The Boxster gearbox is highly geared to reach 160mph. There are always corners around the 50mph mark which can either be taken in 2nd (screaming near the rev limit) or 3rd (lower revs and not enough torque). On the long straights we also have the option of short shifting to 5th gear or holding onto 4th to the rev limit as we approach 130mph. Also for the tighter turns we have the option of following the theoretical racing line of a late turn in, apex 3/4 round the turn and a straighter exit. 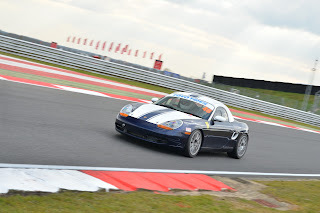 Or experimenting with bringing the car in earlier, tighter and slower, but covering a shorter distance round the corner. Each corner is unique and it often depends on the length of the following straight as to which yields a faster lap time. Overall it was a really successful day, without incident, and I went faster than ever.